Discussion in 'Guides, Mods, and Upgrades' started by Syko_Symatic, Mar 24, 2016. I have completed my LED installation above the build plate. You can find the images below. I must credit @Alex9779 for his help on this subject. My patience can not be found anywhere!! It was tested and eventually lost. I struggled with a bit of the soldering but eventually just moved to the other end of the tape (I had destroyed the copper contact on the first end). The lights are wired directly into the HE2 points on the RUMBA (24v) although from what I understand there is a jumper to set it to 12v). Then in OctoPrint I have a slider and a button to set the brightness using a GCODE command. You can of course type this straight into the terminal with M42 P6 S255 for top brightness! P6 is the point number for HE2 if you were wondering. I simply soldered the wires to the ends of the LED tape (tape was cut to 400mm) and stuck them in the profiles (cut to around 410mm) fed the cables through the nut trap cut outs, and fitted some connectors to make them detachable if needs be. Now I need to upgrade the settings in my config file for OctoPrint to get some nice 720p videos. Edit: Forgot to mention that the lights are fixed in place with 3M poster tabs. They are easily removed and leave no residue. I did not fancy drilling into the acrylic. So here is an extra pic of my messy wiring. I have a nice salvaged connector that allows me to disconnect the LEDs from the main wire. The rest is just some spade connectors (that need cleaning up). I know it's not that clear but I was trying to solve an issue at the time! Mike Kelly, Spoon Unit, PsyVision and 2 others like this. Yeah I know the ones. I considered it and wish I had done that. Luckily my boys were asleep! So is this about the size of it ? Pierce, JohnEsc and Alex9779 like this. All seems good, but you might need to check that the connectors are not just ones that connect the strips only. They do have ones with wires attached which you can cut one end off. I have attached the image. Good to see the idea spreads. Hope to see lots of illuminated boxes soon! JvdP, mike01hu, Spoon Unit and 2 others like this. @Henry feldman you seem to have some adhesion issues with the model. The arms seem to have snapped off ! mhe and mike01hu like this. My son was noting she should pull up her dress, and I asked "with what?" Spoon Unit and mike01hu like this. Joking aside, that looks like a really good print. I presume you already pulled away the support and put it back, but even so .. 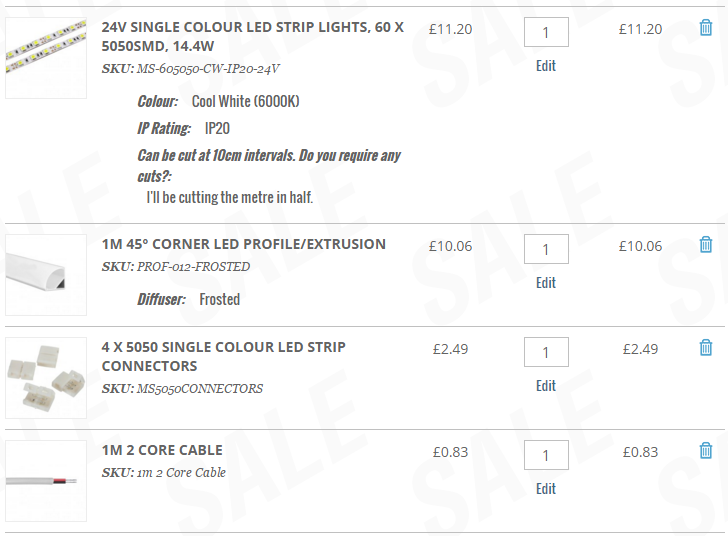 I am thinking to get all from aliexpress (profile, led strip and connectors with cables) but I wonder what is the best profile length. Saws can also be purchased. It's not a controlled item. It will cost significantly less than the LED lighting.